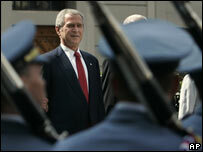 US President George W Bush has criticised Russia for "derailing" its promised democratic reforms. Speaking in the Czech Republic, Mr Bush said the US had strong working relations with Russia and China but there were also "strong disagreements". Moscow rejected Mr Bush's criticisms, saying Russia was a democratic nation. Mr Bush later flew on to Germany for a G8 summit which is in danger of being overshadowed by US-Russia tensions over a US missile defence system. The summit brings together world leaders from the leading industrial countries for a three-day meeting. Climate change is expected to be high in the agenda, along with other issues such as globalisation and trade, and poverty in Africa. Germany and other European governments are pressing for a new treaty to replace the Kyoto agreement - which expires in 2012 - with stricter limits on greenhouse gas emissions. In his speech in Prague, which focused on global democracy, Mr Bush said the US friendship with Russia and China was "complex". He said: "In Russia, reforms that once promised to empower citizens have been derailed, with troubling implications for democratic development." Mr Bush also said the US disagreed with China's leaders who "believe that they can continue to open the nation's economy without also opening its political system". Mr Bush said that although societies developed "at different speeds", certain democratic values were universal. He said: "The United States will continue to build our relationships with these countries and we will do it without abandoning our principles or our values." Kremlin spokesman Dmitry Peskov said Russia "cannot agree on his declaration about the derailing of democratic reforms". He added: "Russia is a democratic country that shares common world and common European values." Mr Bush also called for the "immediate and unconditional release" of dissidents in such nations as Belarus, Burma and Cuba. He listed these nations, along with North Korea, Sudan, Zimbabwe, Iran and Syria as the "worst dictatorships" and criticised Venezuela, Uzbekistan and Vietnam for rolling back earlier "freedom". Mr Bush said he had been accused of being a "dissident president" for pledging the US "to the ultimate goal of ending tyranny in our world". He said: "If standing for liberty in the world makes me a dissident, then I'll wear the title with pride." The Czech Republic is the planned site for a radar base that will form part of the US missile defence shield. Interceptor missiles are planned to be deployed in Poland. Mr Bush, who is expected to meet Mr Putin in Germany, said the new system was a "purely defensive measure, aimed not at Russia but at true threats". He said the Cold War was over and Russia was not an enemy of the US. Russian President Vladimir Putin has threatened to aim weapons at Europe if the system is developed. He has scoffed at US claims that the shield is designed to counter threats from states such as North Korea and Iran, suggesting it was targeting Russia.